A 50th Anniversary Milestone for the Ages! 2017 has been an amazing year for the South African Krugerrand. Since 1967, this beloved coin has literally been the world's gold standard for bullion. So, as you can imagine, the Krugerrand's 50th anniversary year is definitely going down in numismatic history! First, the South African Mint surprised collectors around the world with the launch of the first ever Silver Krugerrand. 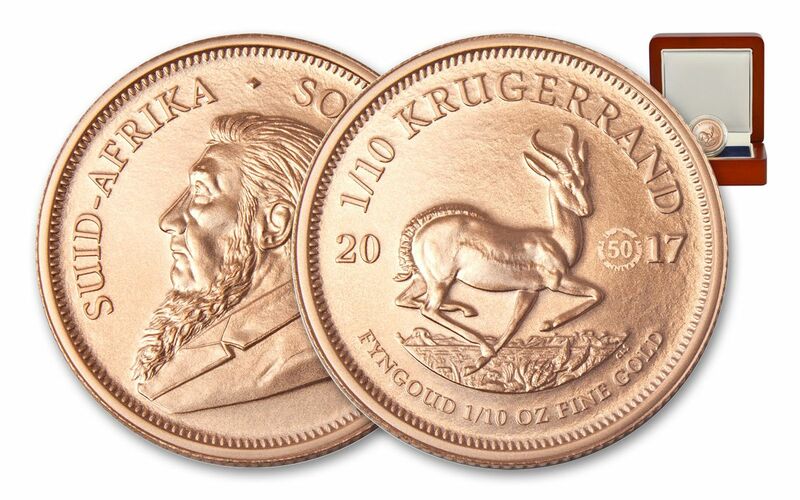 Then, the mint delivered another gift with the release of the first Platinum Krugerrand. But now, it's time to go back to the Krugerrand's precious metal of choice -- gold! And this limited edition 2017 1/10-ounce Gold 50th Anniversary Krugerrand is truly something special! A TIMELESS DESIGN AS YOU'VE NEVER SEEN IT BEFORE! -- It's the design collectors and goldbugs know by heart -- an iconic springbok antelope on one side, former South Africa President Paul Kruger on the other. But for the Krugerrand's 50th anniversary, state-of-the-scanning and laser etching technology have unlocked the details hidden in the coin's original 1967 etching, bringing new dimension and definition to a legendary design! SPECIAL ANNIVERSARY MINTMARK -- These limited-edition uncirculated Gold Krugerrands also feature a 50th anniversary mintmark with the dates 1967 and 2017. Featured on 2017's silver coins and proofs, as well as the year's platinum and gold proofs, only a few select uncirculated condition Gold Krugerrands will feature this milestone mintmark! 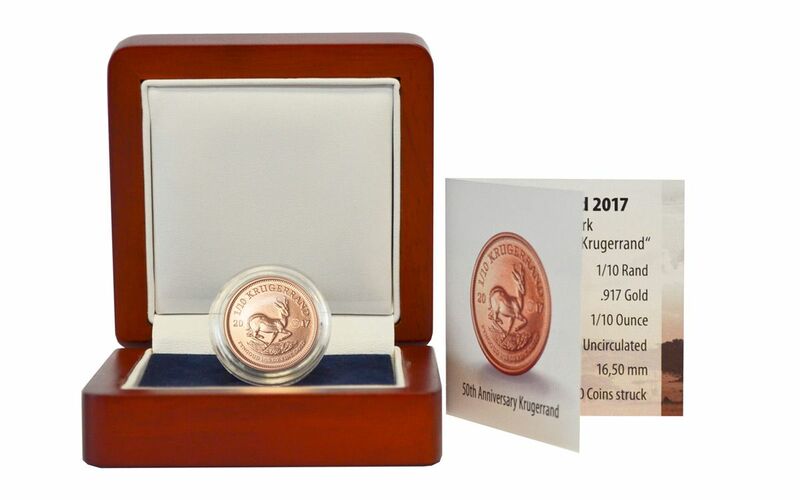 SOUTH AFRICA LEGAL TENDER -- Minted in 1/10-ounce of 22 carat gold, each 2017 50th Anniversary Krugerrand is 1/10 rand South Africa legal tender, a fact reflected on the coin's reverse along with the iconic antelope and 50th anniversary mintmark. 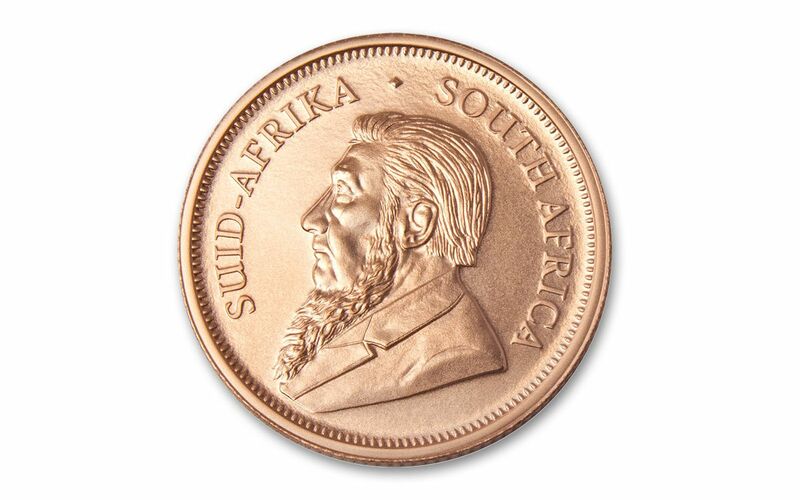 ORIGINAL SOUTH AFRICAN MINT PACKAGING -- Struck in gorgeous uncirculated condition, your 1/10-oz Gold Krugerrand will arrive to you encased in an acrylic capsule, secured inside a crafted South African Mint presentation case along with an official mint certificate of authenticity. AN EXTREMELY LIMITED MINTAGE -- Out of the many 1/10-oz Gold Krugerrands struck in 2017 by the South African Mint, only 2,000 of these uncirculated condition coins will possess the 50th anniversary mintmark! 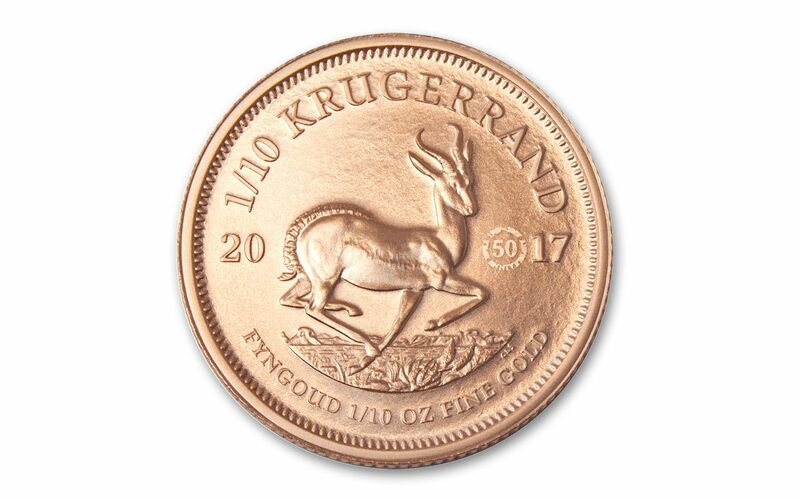 2017 has been a year full of phenomenal firsts for the South African Krugerrand, and collectors everywhere have been rushing to secure as many releases as they can. With this piece of coin history at an incredible value, you can be part of this elite group. But don't wait -- this opportunity can disappear with the blink of an eye (or the leap of a springbok)! Make this 1/10-oz 50th Anniversary Uncirculated Gold Krugerrand yours today!